Support your loved one with this great Personalized Epilepsy Awareness T-Shirt, whether it’s your Child, Grandchild, Sister, Brother, Friend or any loved one you know battling with Epilepsy. Our Personalized Epilepsy Awareness T-Shirt is available on our premium 100% cotton T-Shirt, machine washable in youth sizes XS-L and adult sizes S-3XL. Free personalization of any name is included. Additional Info Wear this Personalized Epilepsy Awareness T-Shirt or our Personalized Epilepsy Awareness Hoodie at your next Walk Event. Be sure to also bring along our Personalized Epilepsy Water Bottle to show your community who you are walking for. 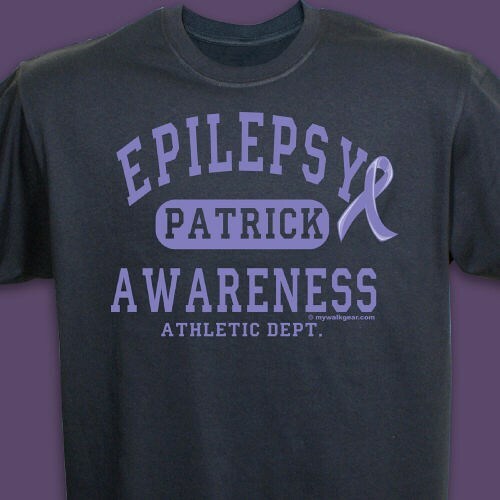 For all your Personalized Epilepsy Shirts and Walk Gear, shop MyWalkGear.com today.